French painter whose career can be traced in some detail. His early life was spent in his native Troyes. By 1622 he was in Rome, where he remained for about four years. In 1626 he was back in Troyes, and the following year he received commissions for pictures for the Troyes Cathedral, which no longer survive. In 1634 he moved to Paris, where he executed in 1636 a May for Notre Dame, which was an annual commission for the cathedral. Three years later he again returned to Troyes, where he seems to have spent most of the rest of his career. Both in style and accomplishment, L Estin was close to his near contemporary Guy Franois in Le Puy. In Rome in their impressionable youth, both painters rapidly assimilated the popular style, and both were incapable in their maturity of developing this style in their native province. L Estin was still painting in the Baroque manner, which had been fashionable in 1630 under the dominance of Vouet, thirty years after it had gone out of date. 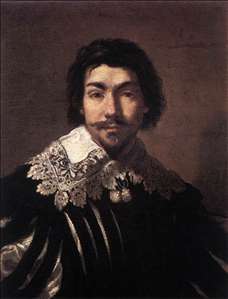 His stylish self-portrait at Troyes shows him to have had an affinity with Vouet, whom he would have known in Rome. Most of L Estin surviving pictures are in the churches of the Troyes region for which they were originally painted.